Hey friends! How are you today? We had some cuh-razy thunderstorms last night so I'm feeling a little baggy under the eyes, but that's ok. It's SPRING! My favorite season. I needed a little something to lighten this place up a little bit. A while ago, I had purchased some mini wreaths from hobby lobby. They were only 1.50 for 6. I bought two packs because I thought I'd spell out our last name. Then I thought it would be fun to make a springy banner with them. Here's how it turned out. I like it ;) What do you think? I bought the letters in the scrapbook section of Jo-anns. When summer comes, I'll just change the letters! I also bought the mini-clothes pins there. I used scraps of burlap and fabric to tie the wreaths together and used a hot glue gun to keep the ric rac in place. Thanks to all the friends who linked up this week to "20 minute Tuesday". All of the links were so inspirational and fun it was hard to choose a few. BUT I did. And here are my faves. Check out this cute idea from Strawberry Sky. 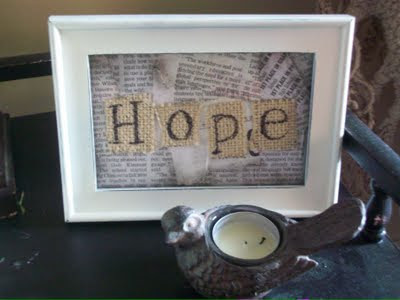 I love the look of this newspaper frame with the word "hope" on burlap. 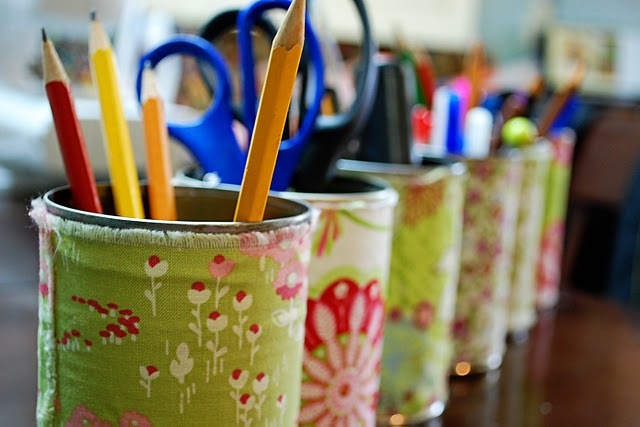 So easy, cute and inexpensive! 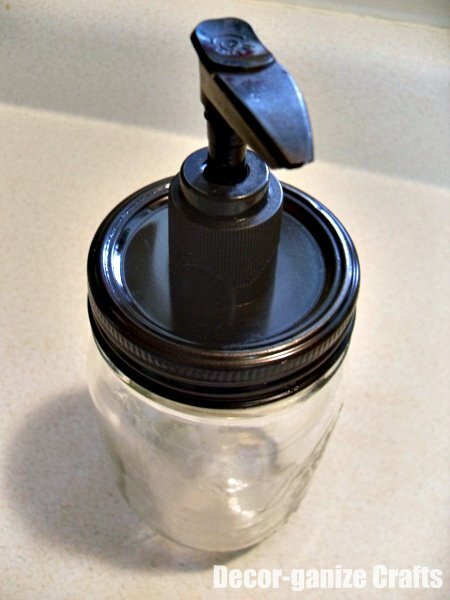 This do it yourself soap jar over at Decorganize crafts is a wonderful idea. I really like how it holds a lot of soap and that it adds some flair to your bathroom or kitchen sink! This is another "upcycle" idea that I really like. 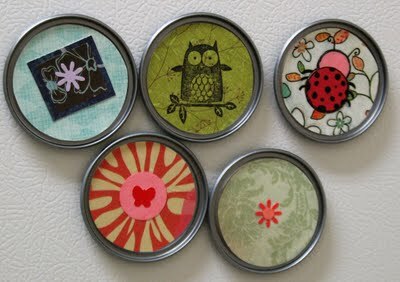 Soup can's transformed into oh-so cute "stuff holders" by Toads Treasures. She washed up some scraps of fabric for a shabby look. So great. I'm going to do this, FO SHO. So cute, I love that you can change it out too! 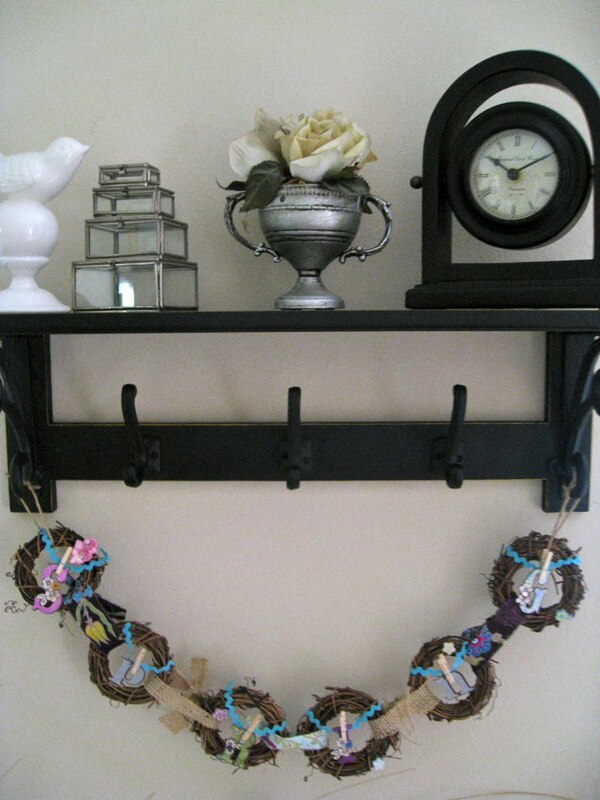 Love the wreath garland! So cute! The banner will be good for all four seasons! Never realized before that they all have 6 letters in their names (as long as you use Autumn instead of Fall). Very fun project. Thanks for the shout out! I'm you're newest follower! Cute blog! Great shout-outs! Found your blog through the link-up at Tatertots and Jello. I'm your newest follower and LOVE the mini wreaths. So creative!